There are so many FREE things to do in Boston, especially during the summer! 1. Highland Street Foundation Free Fun Fridays with free attractions across Massachusetts every Friday this summer! Fridays from June 23, 2017 to August 25, 2017. 2. Free Outdoor Movies in Boston with Free Friday Flicks at the DCR Hatch Shell on the Esplanade on Friday nights this summer starting at dusk. Fridays from June 23, 2017 to August 26, 2017 with some exceptions. 3. Magic Family Film Festival at the Prudential Center Courtyard on Saturday nights at dusk this summer. Saturday nights from July 1, 2017 to August 26, 2017. 4. Free Movie Nights at Christopher Columbus Park on Sunday nights this summer. Sunday nights from July 16, 2017 to August 27, 2017. 5. Head to Assembly Row in Somerville for Sylvester Baxter Riverfront Park Movie Series on Saturdays at dusk this summer. July 8, 2017 to August 26, 2017. 6. Mayor Walsh’s Free Movie Nights in various Boston Neighborhoods on various nights. August 7, 2017 to August 31, 2017. 7. Boston Harbor Hotel’s Summer in the City Series with free music on Tuesday, Wednesday and Thursday nights this summer and free moonlight movies on Friday nights this summer. June 8, 2017 to September 8, 2017. 8. Free Boston Calling Block Party every Thursday evening from 5-8pm at Dewey Square. Every Thursday night until September 14, 2017. 9. Berklee’s Summer in the City Series with over 200 free music performances all over the city. Now through end of September, 2017. 10. Boston Public Library’s Free Concerts in the Courtyard with free music every Wednesday night at 6pm and Friday afternoon at 12:30pm. Rain location: Rabb Hall if needed. FiNow through August, 2017. 11. Midday Music at Post Office Square with free music on Tuesdays and Thursdays from 12-2pm. Now through August 31, 2017. 12. Free Summer Concert Series Harborwalk Sounds at the ICA on Thursday nights from 6-8:30pm. (Reminder: ICA admission is also free on Thursday nights). Thursday nights from July 6-August 31, 2017. 13. Free Landmarks Orchestra Classical Concert at the Hatch Shell on Wednesday nights from 7-9pm. Wednesday evenings from July 19, 2017 to August 23, 2017. 14. Free Summer Concerts on the Greenway with free music at 5pm on Friday nights at the Greenway’s North End Park. July 7, 2017 to September 8, 2017. 15. Free Concert Series sponsored by the city of Boston throughout the summer + many more free concert series this summer! Ongoing. 16. So many Free Fitness Classes and Events in the Greater Boston Area this summer. Dates vary. 17. Free fitness classes, live music, children activities and more at Summertime at the Street in Chestnut Hill. Now to October 1, 2017. 18. Celebrate with one the largest Patriotic celebration in the nation with Boston Harborfest! June 30-July 4, 2017. 20. Head to Boston Common for Shakespeare on the Common with Romeo & Juliet by William Shakespeare. July 19-August 6, 2017! 21. Free fitness, outdoor movies, music, and open lawn time available at The Lawn on D. All summer long. 22. Check out a North End Feast this summer. Dates vary, but most weekends in August and more. 23. Kids Bowl Free all summer at over 20 participating bowling alleys across Massachusetts. 24. Active Military can receive free museum entry until Labor Day from Blue Star Museums from many attractions across Massachusetts and more. Through Labor Day. 25. Free Museums and discount attractions with your Boston Library Card with advanced reservation. 26. Free Admission at Isabella Stewart Gardner Museum for Neighborhood Nights. Thursdays nights from 5-9pm on July 13, July 27, and August 10, 2017. Please let me know if I missed any of your favorite free summer events in Boston! 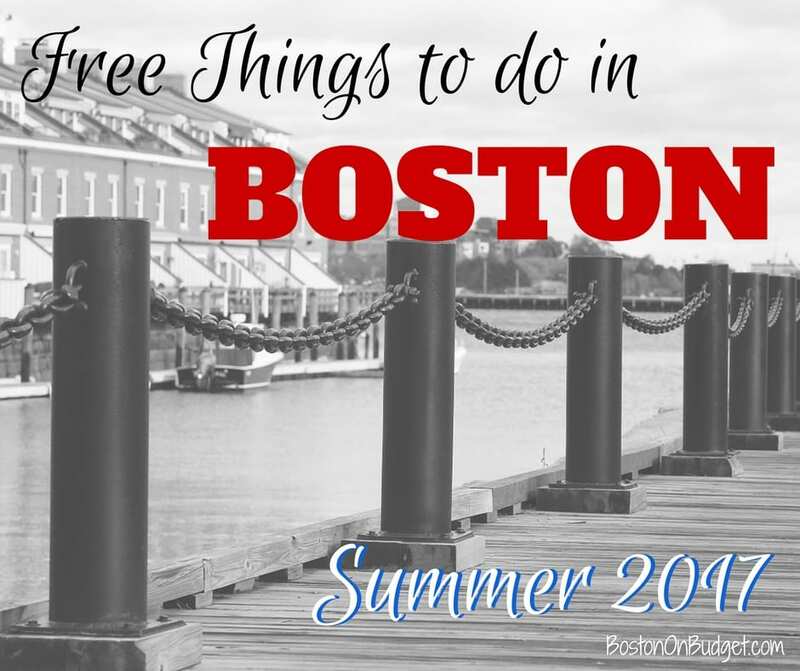 Make sure to check the blog all summer long since there’s a lot more fun and free summer events in Boston this summer, including a new weekly series of Cheap Things to Do this Week! What is your favorite free event in Boston this summer? Is your favorite Boston activity on the list?